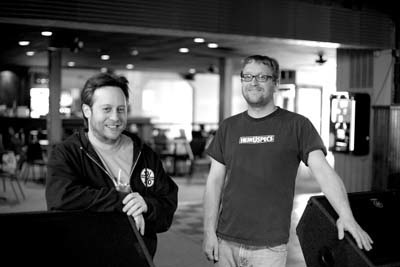 Marc Leibowitz, left, and Jim Johnson outside Sokol Underground circa 2003. First, happy anniversary to 1% Productions. Yesterday the production company headed by Marc Leibowitz and Jim Johnson acknowledged its 20th anniversary on Facebook. The date came in under the radar and surprised some folks (I believe Guided By Voices was originally going to mark the occasion, but that show got cancelled). Want to read about the origins of 1% Productions? 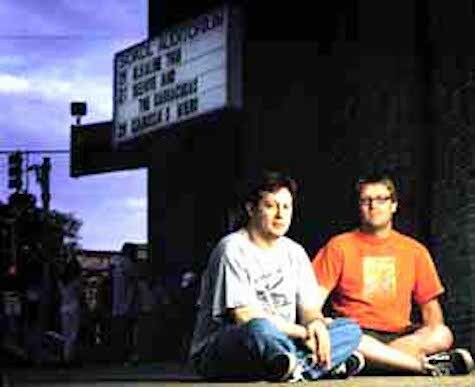 Here’s a rather longish cover story about Marc & Jim and the company’s origins way back in July 2003. The photo on top of today’s post came from the article. They haven’t aged a day (heh-heh). Lung at O’Leaver’s Oct. 20, 2017. Last Friday night I meandered to fabulous O’Leaver’s for a set by Lung, the cello-and-drum duo of Kate Wakefield and Daisy Caplan. 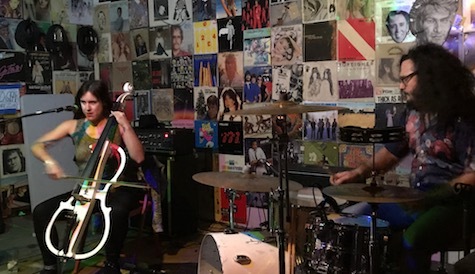 I’m always amazed by how rock music sounds performed on electric cello — it has the same drama, the same intensity as electric guitar, and certainly that was the case when these two performed. They reminded me of another cello-fueled show at O’Leaver’s about 14 years ago. The band was Matson Jones, a string combo with a couple cellos who played a similar style of indie rock, though Matson Jones’ vocals were raw and distorted, a sharp contrast to Wakefield’s bright alto that cut through the cello’s dense thrumming and Caplan’s bombast. Crybaby at O’Leaver’s, Oct. 20, 2017. Opening was a newcomer (to me, anyway) Crybaby, a.k.a. Amanda, the drummer from sludgecore band Bonghammer. 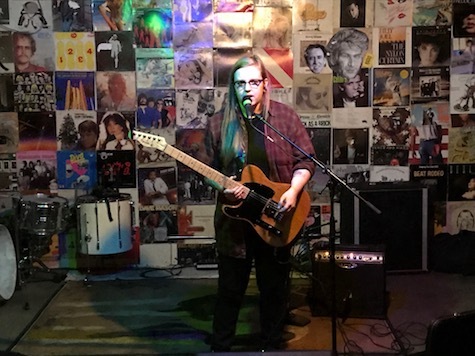 She had a gorgeous voice singing on Liz Phair-style indie tunes played with an electric guitar connected to a repeater pedal. The compositions were simple, her lyrics were honest and matter-of-fact — sweet, broken-hearted confessions, lovely and downcast, and she knew it, jokingly apologizing throughout her short set for her sad songs. Tonight is that Deer Tick show I wrote about on Monday (read the 10 Qs with John McCauley). Opening at 8 p.m. is musician/comedian Chris Crofton. $23. Reverb: Omaha’s Mid-Century live music lounge (in the column); and how many bars are in Benson, anyway? A look inside the new Reverb Lounge as well as some Q&A with one of its owners, Jim Johnson, is the subject of my column this week. Jim talks about his vision for the club and why One Percent decided to open another bar literally feet away from two other bars they own. It’s in this week’s issue of The Reader and online right here. As I say in the column, I foresee that I’ll be spending a lot of time at Reverb. As Omaha continues to get bigger and bigger, I’m spending more and more time in a smaller geographical location — i.e., Benson. Back in the old days, going to shows would mean driving to way south to Sokol, to downtown Omaha, out to The Asylum on West Center, and so on. These days most of my time is spent on Maple Street, with the occasional trek to O’Leaver’s. I haven’t been to The Slowdown in a few months (due to a combination of factors including 1) going to fewer mid-week shows, 2) Slowdown booking more private functions on weekends, along with 3) Slowdown booking fewer indie shows). My coverage is definitely becoming too Benson focused, both in this blog and in my column. There is a world west of 72nd Street, though these days, I rarely step foot in it. And with clubs like Reverb opening, I’m less apt to. So what’s the current bar count in Benson? Let’s see (not counting restaurants that serve booze): Jerry’s, Full House, Beercade, Krug Park, The Waiting Room, Burke’s, 1912, The Sydney, The Musette, St. Andrews, Benson Brewery, Infusion, Jake’s, The Barley Street and now Reverb. That’s 15 (and I’m probably missing something). That’s a lot of bars in about a half-mile stretch of road. You have to ask yourself if there’s enough people to keep them all afloat. 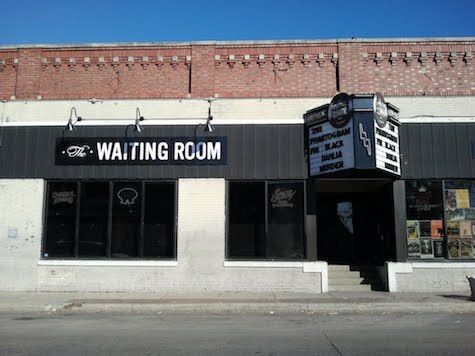 BTW, news to me (though probably news to no one else), Jim told me that The Waiting Room is only open when an event or show is booked. Did not know that. — There will be tables and chairs added to Reverb’s concert space when appropriate. Jim is even considering adding row seating for some performances. — There are no TVs in Reverb, nor video games or pinball. — Jim said they’ll be adding some “sound treatment” to the concert room in the near future. Again, you really need to check it out, whether there’s a show scheduled (check out their website to see) or not. And man, they make a potent mai tai.